June 18, 2009, The FAA has reported that Continental Flight 61 departed Brussels at 9:45 AM, enroute to Newark International Airport. 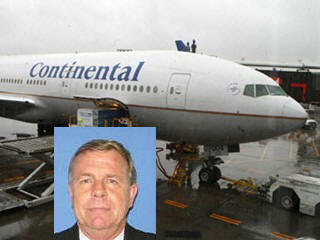 Three hours into the flight Captain, Craig Lenell while piloting Continental Flight 61 died to what appears to have been a heart attack. Continental Flight 61, a Boeing 777 with 247 passengers, landed at Newark under thick fog at 11:49 AM safely. The crew on this flight included an additional relief pilot who took the place of the deceased pilot. The flight continued safely with two pilots at the controls." Crew had alerted passengers enroute over the pa-system there was a medical situation and asked if there were any doctors on the flight. Dr. Julien Struyven, 72, a cardiologist and radiologist from Brussels responded to the call for doctors, went to the cockpit and examined the pilot. "He was not alive," Struyven said. There was "no chance at all" of saving him, he said. Struyven said he suspected the pilot had a heart attack. He said he used a defibrillator to try to revive the pilot, but it was too late. Passengers onboard were not aware of the incident until the plane had landed and they herd it on the news. "There was no point in telling people, it would have created a lot of panic and stress, and for what? We were in the middle of the Atlantic Ocean," said passenger Steven Weitz, who learned the pilot died after his son called him when the plane landed. "I think that they did the best that they could do. They have co-pilots for things just like this and he or she did exactly what they were supposed to do. We're here, we're safe," said passenger Susan Morgan.